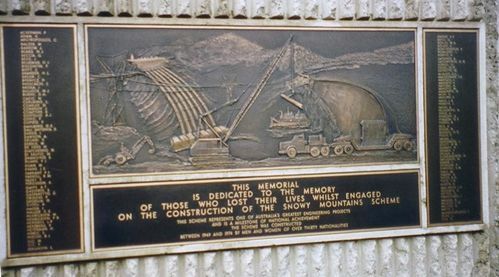 The Snowy Mountains Scheme Workers Memorial commemorates the 121 people who died while working on the Snowy Mountains Scheme. During the course of the construction over approximately 22 years, at total of 100,000 workers were employed, of whom 121 lost their lives in industrial accidents. Those workers were Australian-born, German, Greek, Irish, Italian, Norwegian, British, Polish and Yugoslav. The most fatalities were caused by accidents involving operating plant such as bulldozers, haul trucks, cranes and tournapulls (a four-wheel vehicle similar to a grader or front-end loader).